Quarterback – Jeremiah Briscoe, junior, 6-foot-3, 209 pounds, Sam Houston State. Running backs – Chase Edmonds, junior, 5-9, 205, Fordham; Tarik Cohen, senior, 5-6, 170, North Carolina A&T State. Linemen – Julie’n Davenport, senior, 6-7, 315, Bucknell; Jessamen Dunker, senior, 6-5, 290, Tennessee State; Zach Johnson, senior, 6-4, 331, North Dakota State; Landon Lechler, senior, 6-7, 298, North Dakota State; Mitchell Kirsch, 6-6, 300, senior, James Madison. Tight end – Dallas Goedert, junior, 6-4, 250, South Dakota State. 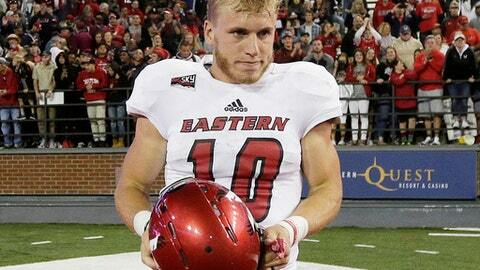 Wide receivers – Cooper Kupp, senior, 6-2, 215, Eastern Washington; Karel Hamilton, senior, 6-1, 205, Samford. All-purpose player – Detrez Newsome, junior, 5-10, 210, Western Carolina. Kicker – Griffin Trau, sophomore, 5-8, 180, Richmond. Linebackers – Dylan Cole, senior, 6-1, 240, Missouri State; Alex Scearce, senior, 6-3, 220, Coastal Carolina; Darius Leonard, junior, 6-3, 220, South Carolina State. Defensive backs – Donald Payne, senior, 6-0, 223, Stetson; Cole Reyes, junior, 6-2, 215, North Dakota; Lorenzo Jerome, senior, 6-0, 195, Saint Francis (Pa.); Dee Delaney, junior, 6-1, 193, The Citadel. Punter – Miles Bergner, senior, 6-0, 225, South Dakota. Quarterback – Gage Gubrud, sophomore, Eastern Washington. Running backs – Khalid Abdullah, senior, James Madison; Jonah Hodges, senior, San Diego. Linemen – Corey Levin, senior, Chattanooga; Erik Austell, senior, Charleston Southern; Brandon Parker, junior, North Carolina A&T State; Casey Dunn, senior, Jacksonville State; Nick Demes, senior, Penn. Tight end – Eric Saubert, senior, Drake. Wide receivers – Brian Brown, senior, Richmond; Kamron Lewis, sophomore, St. Francis (Pa.). All-purpose player – Rashard Davis, senior, James Madison. Kicker – Lane Clark, sophomore, Tennessee State. Linemen – Donovan McCray, senior, Grambling State; Keionta Davis, senior, Chattanooga; Anthony Ellis, junior, Charleston Southern; Derek Rivers, senior, Youngstown State. Defensive backs – Mike Basile, junior, Monmouth; Casey DeAndrade, senior, New Hampshire; Deion Harris, junior, North Dakota; LeRoy Alexander, senior, Youngstown State. Punter – Jake Ryder, senior, Towson. Quarterback – Devlin Hodges, sophomore, Samford. Running backs – Lenard Tillery, senior, Southern; Lorenzo Long, senior, Wofford. Linemen – Taylor Gadbois, senior, Southeastern Louisiana; Anton Wahrby, senior, Wofford; Mark Spelman, senior, Illinois State; Jerry Ugokwe, senior, William & Mary; Max Rich, senior, Harvard. Tight end – Andrew Vollert, junior, Weber State. Wide receivers – Jake Wieneke, junior, South Dakota State; Troy Pelletier, junior, Lehigh. All-purpose player – Jody Webb, senior, Youngstown State. Kicker – Erik Medina, senior, Texas Southern. Linemen – Pat Afriyie, junior, Colgate; Samson Ebukam, senior, Eastern Washington; Greg Menard, junior, North Dakota State; Winston Craig, senior, Richmond. Linebackers – Garrett Dolan, junior, Houston Baptist; Darien Anderson, senior, Alcorn State; Chad Geter, senior, Gardner-Webb. Defensive backs – Nick Gesualdi, junior, Cornell; Danny Johnson, junior, Southern; Xavier Coleman, senior, Portland State; Jaylen Hill, senior, Jacksonville State. Punter – Tate Lewis, senior, Southern Utah.